Planet Erde - Forscher haben einen Ausbruch von hochenergetischer Strahlung als "Dark Lightning" unmittelbar vor einem Blitz der als gewöhnlicher Blitz bekannt identifiziert. WASHINGTON -- NASA Television will broadcast an unpiloted Russian cargo ship's departure from the International Space Station on April 15 and the launch and docking of another April 24 and 26. The ISS Progress 49 resupply ship, which arrived at the station in late October, will depart the rear port of the station's Zvezda service module at 8:01 a.m. EDT, April 15. NASA TV coverage of the undocking will begin at 7:45 a.m. Progress 49 will reenter Earth's atmosphere several days later and burn up over the Pacific Ocean. Progress 49's departure will clear the way for the arrival of the ISS Progress 51 cargo craft. Loaded with more than 3 tons of food, fuel, supplies and experiment hardware for the six crew members aboard the orbital laboratory, Progress 51 is scheduled to launch from the Baikonur Cosmodrome in Kazakhstan at 6:12 a.m. (4:12 p.m. Kazakh time) Wednesday, April 24. NASA TV coverage of the launch will begin at 6 a.m.
Progress 51 will take two days to catch up and rendezvous with the space station. It is scheduled to dock at 8:27 a.m. Friday, April 26. NASA TV coverage will begin at 7:45 a.m. The ship is scheduled to dock with the ISS at about 16:26 Moscow time on Friday, April 26. The ship is flying to the ISS by the standard two-day pattern, not a new six-hour one. A few previous supply ships, including Progress M-16M launched in August 2012, Progress M -17M launched in October 2012 and Progress M-18M launched in February 2013 reached the ISS within six hours. An unmanned cargo-carrying spacecraft successfully docked with the International Space Station Friday morning (April 26), despite a glitch in the capsule's navigation system. After its launch from the Baikonur Cosmodrome in Kazakhstan on Wednesday, the Russian Progress 51 spacecraft failed to deploy one of the two antennas used for the Kurs automated docking system. 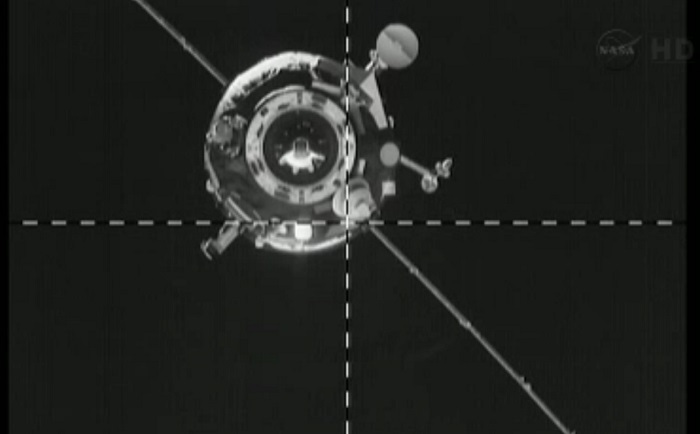 Russian ground controllers were able to reposition the antenna, allowing the automated docking to go ahead as planned. Russian cosmonauts Pavel Vinogradov and Roman Romanenko kept an eye on Progress as it moved into position.